Transportation agencies wishing to close at-grade crossings or implement safety upgrades on a corridor may face challenges in addressing the concerns of the communities that live and work along that corridor. Listening to communities and giving residents the authority to decide what and where to implement changes can both improve safety as well as enhance the public's relationship with the DOT. A 19-mile rail corridor in Southwest Missouri has one of the highest incident rates in the State and has been a top safety priority for Missouri Department of Transportation (MoDOT) and BNSF Railway Company (BNSF) for nearly two decades. This rural corridor with 29 at-grade crossings experienced 62 incidents since 1975, including 14 fatalities and 19 injuries. Since 2010, 7 near-misses and 12 broken gates have been reported. Many citizens who live in communities along the corridor use these crossings to access other sections of their towns and were initially resistant to crossing closures. A vital element of this process involved proactive stakeholder outreach with local emergency responders, schools, businesses, and elected leadership within the corridor. Evaluate all rail-highway crossings within the corridor. Provide streamlined solutions to increase safety. Deploy a public input process that would bring about community support for effective, collaborative consolidation and safety improvement recommendations. To oversee the public input process, MoDOT hired a consultant to act as a neutral third party. The consultant's approach was to listen to the citizens' perspectives and then obtain buy-in by letting the community suggest solutions that would address the safety concerns identified. The process began with listening sessions in each community. U.S. Highway 60 runs parallel to the rail corridor and serves as a vital arterial for three rural communities. Due to the location of the BNSF Cherokee Rail, passenger, commercial, and emergency vehicles must cross the railroad to access either the western or eastern parts of their communities. "During meeting one, there was purposely no proposal from us," said MoDOT Rail Safety Specialist Jack Wright, noting that the consultant urged attendees to offer their own ideas about what the problems were and how to solve them. During the second meeting, the consultant provided a list of options MoDOT developed based on the problems and potential solutions the community had identified during the first meeting. Each alternative also included the results of a benefit-cost analysis. The consultant presented each option and let the community vote on them. A third meeting was then held to convey the results and explain how MoDOT planned to proceed. "The one big surprise coming out of these meetings was that the communities along the corridor did not vote for the no-closure option," noted Larry Scheperle, MoDOT Rail Safety Specialist, adding that it was evident the community was hearing the safety message. The MoDOT Rail Section attributed the success of this effort to the decision to bring in an outside consultant to act as an impartial facilitator. "If you have an area where the communities are not responsive to an agency's standard means or methods [of implementing improvements], find a neutral party and go through this process to let them act as an intermediary," advises Chris Brownell, MoDOT Railroad Projects Manager. "Just share the facts. Tell them, 'We have funding to improve this. Can we do this together?'" 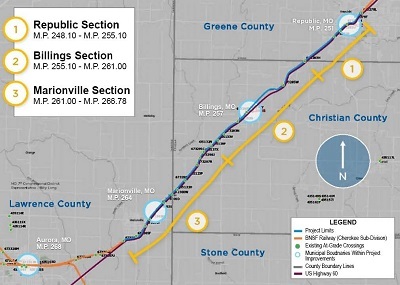 Along with a funding contribution of nearly $1 million from BNSF, MoDOT has committed to fund roughly half the cost of the estimated $5 million in corridor improvement projects. The rail crossing safety benefits identified by the study, combined with strong public consensus for the projects, led MoDOT to prioritize the whole corridor project that included five crossing closures and four crossing upgrades. To fund the remainder, the agency submitted a grant application to the Federal Railroad Administration. When complete, the five proposed closures along with the upgrades and site improvements throughout the corridor will allow for 23 fewer crashes, with 1.41 fewer fatal crashes, 7 fewer injury crashes, and 15 fewer non-injury crashes over a 25-year period as compared with the baseline estimates. As a result of this success, the MoDOT Rail Section is considering using this approach at another location along a similar length of railroad to engage the small rural communities along the corridor in building a consensus for safety improvements.